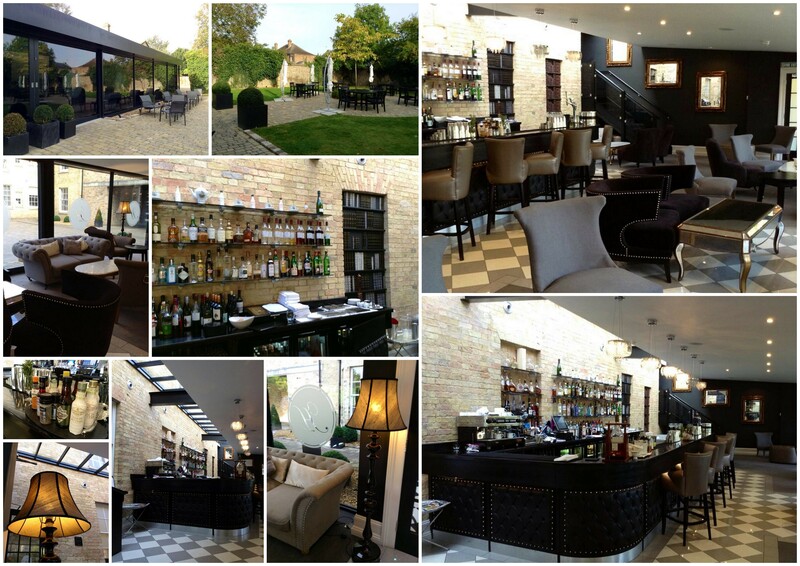 We enjoyed our complimentary cocktails on arrival and sat at the bar, admiring this section of the hotel that has been refurnished with a glass extension. We liked the ambience so much we decided to linger a bit longer and unwind with a few extra drinks. Our luggage was whisked away to our room and one of the butlers took the time to show us around the room, which was spacious and overlooked the courtyard. 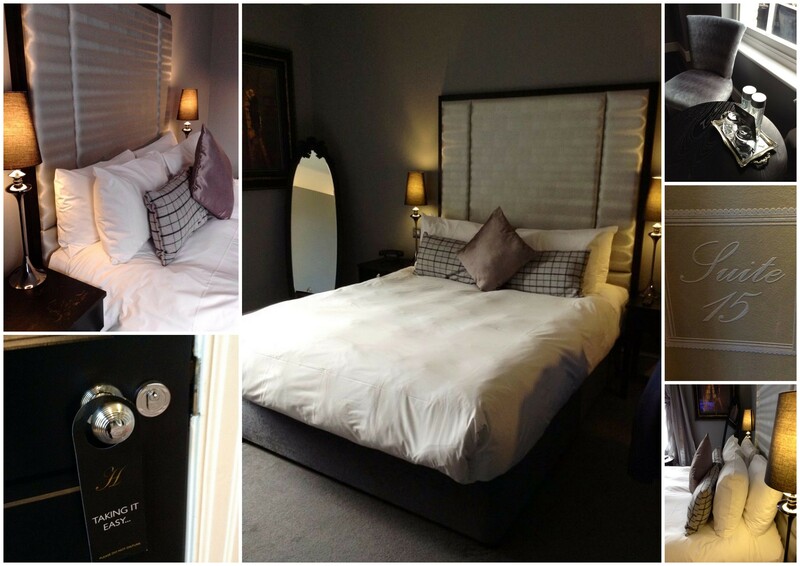 There is a separate shower room, then a little corridor leading to the bedroom behind another door. 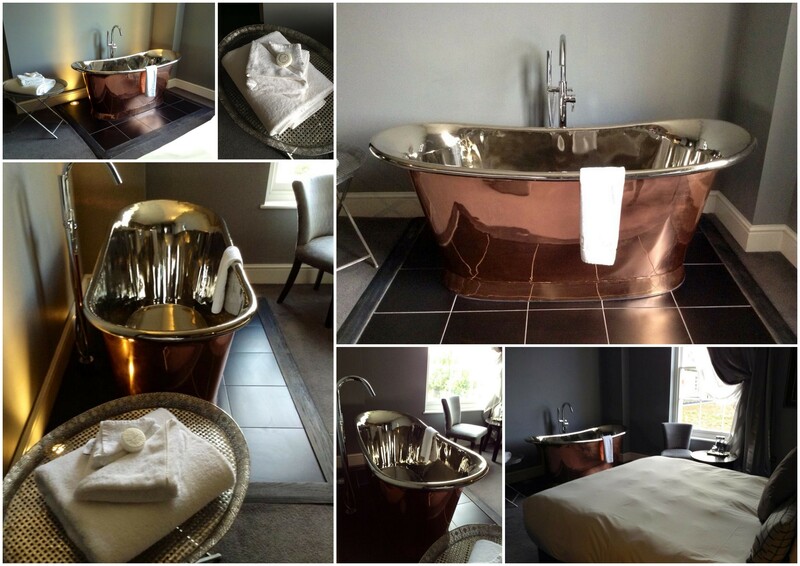 The room is equipped with a king sized bed, flat screen TV, iPad mini, wardrobe and mood lighting, but the crowning glory is the stunning copper bath at the foot of the bed. 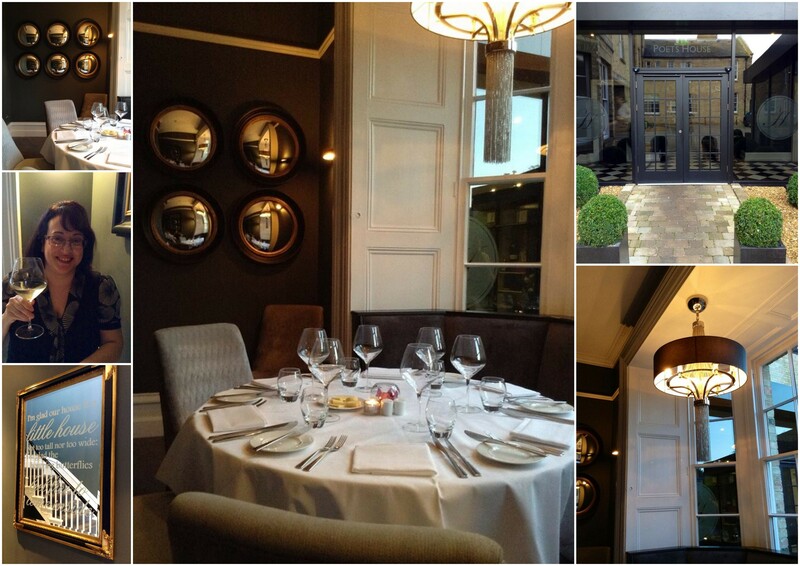 The calming environment continued to The Dining Room, with its muted colours and elegant style. We were shown to a quiet table and given the menus. The wine list was impressive and we decided on a bottle of Sancerre that went well with our meal. 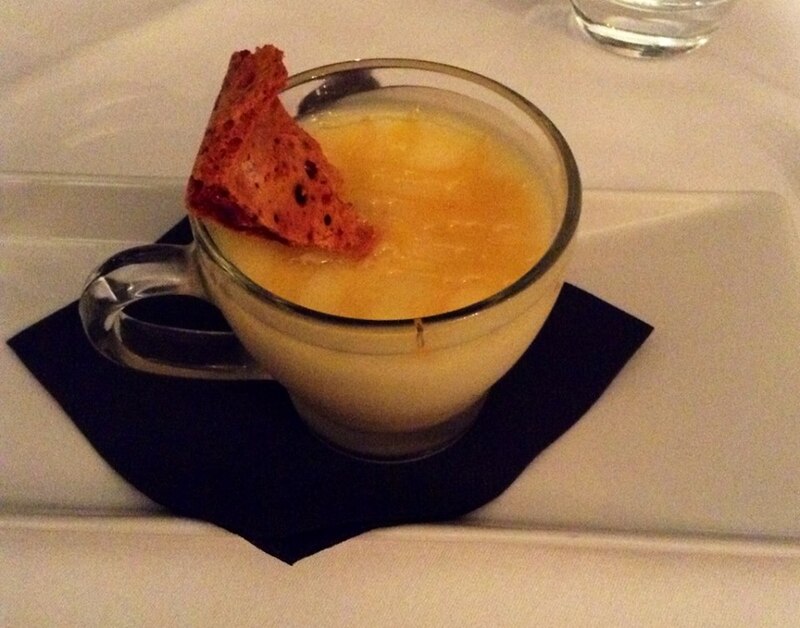 The menu included classic ingredients with an innovative twist. 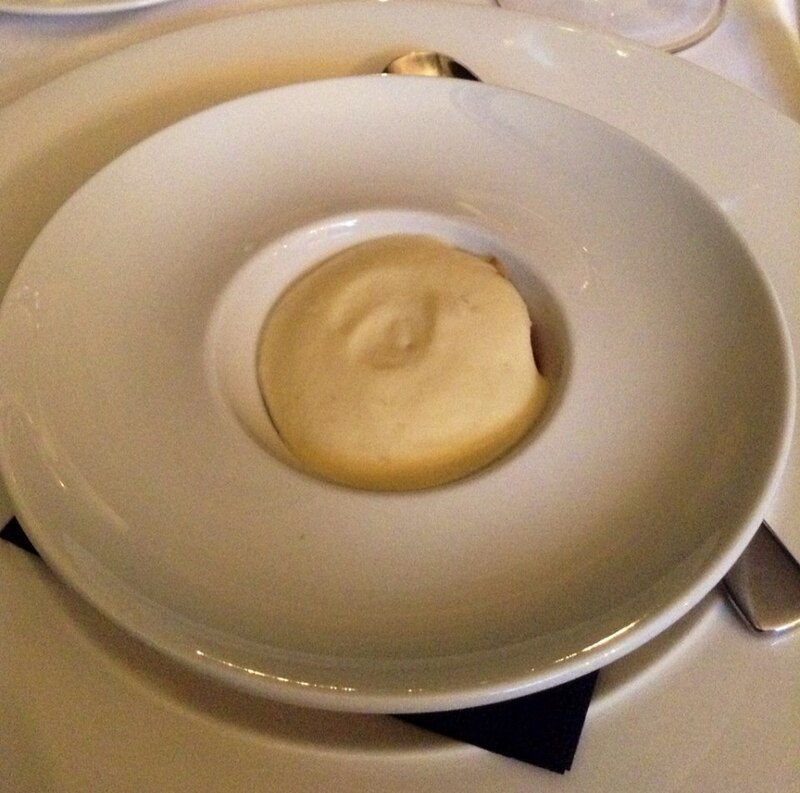 A little surprise was an amuse-bouche, consisting of a mixture of celeriac, apple and chestnut. The flavours set the tone for my main, which had similar ingredients. The starters were little works of art, served in gorgeous oversized bowls. 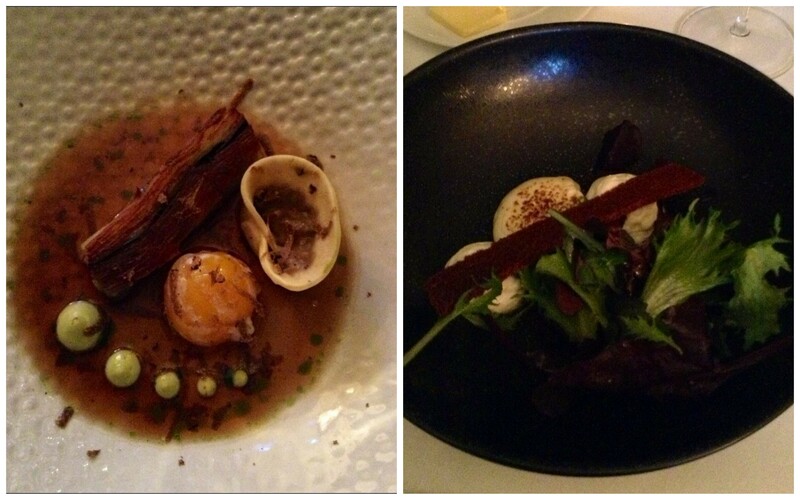 Paulo’s starter was “Pressed heritage potato and truffle, mushroom consommé, truffle tortellini, tarragon and confit egg yolk”. I enjoyed my glazed goat’s cheese crotin, with beetroot, apple and pain d’épices, served with dressed leaves. All of the flavours worked really well together in both dishes. Our mains were again served in oversized plates and bowls. 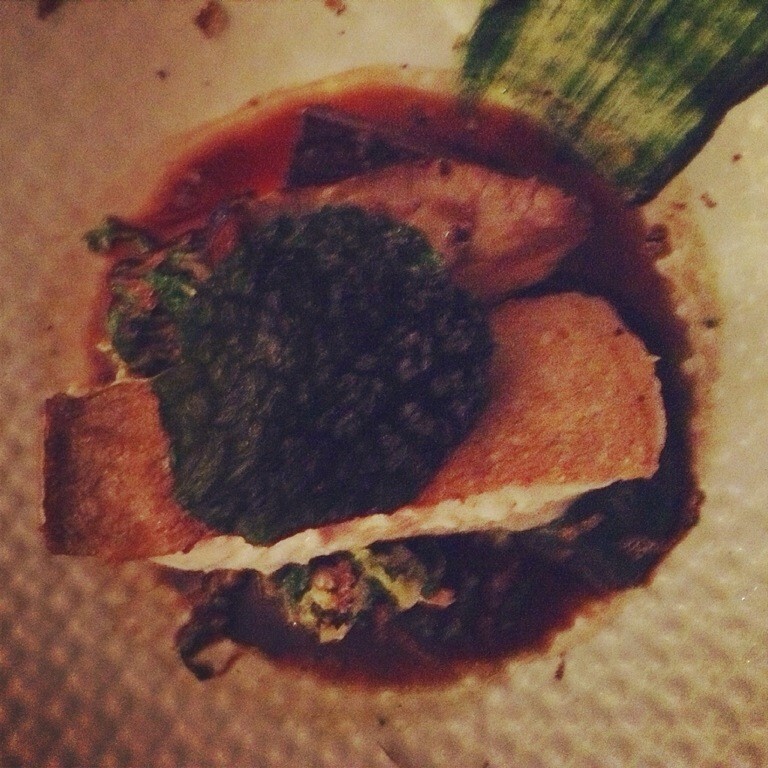 Paulo had a beautifully presented dish featuring line caught Cornish cod, ox cheek, truffle and roasted cep mushroom. All of the ingredients were very fresh. 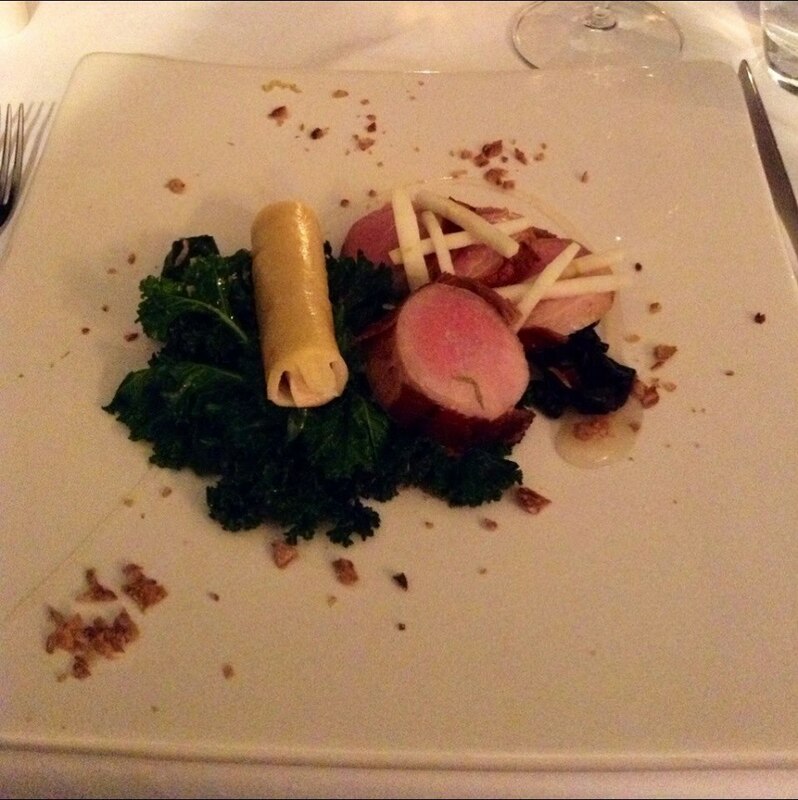 I had the tenderloin of pork, served with curly kale, julienned granny smith apples, chestnut and black trumpets. The pork was cooked medium, with a little pink in the middle, so it was very tender and juicy. I never had black trumpets before and I thoroughly enjoyed the rich and smoky flavour of this gourmet mushroom. 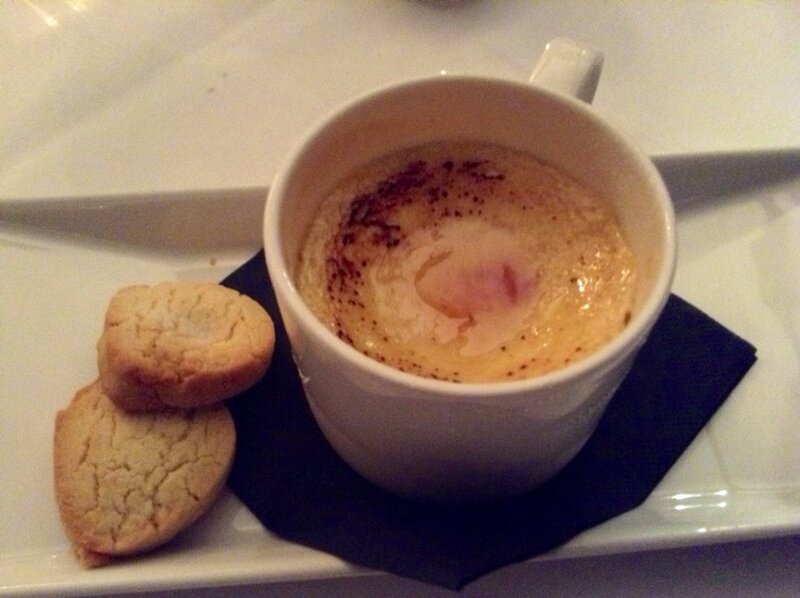 Our desserts were Bailey’s crème brûlée with shortbread and lemon posset with a raspberry honeycomb. Both were a sweet and tasty way to end the meal. Breakfast the next morning was in The Dining Room. The ambience was cheerful yet relaxing. The buffet was nicely laid out with a good selection of fruit, cereals, danish, croissants, yogurt and various fruit juices. 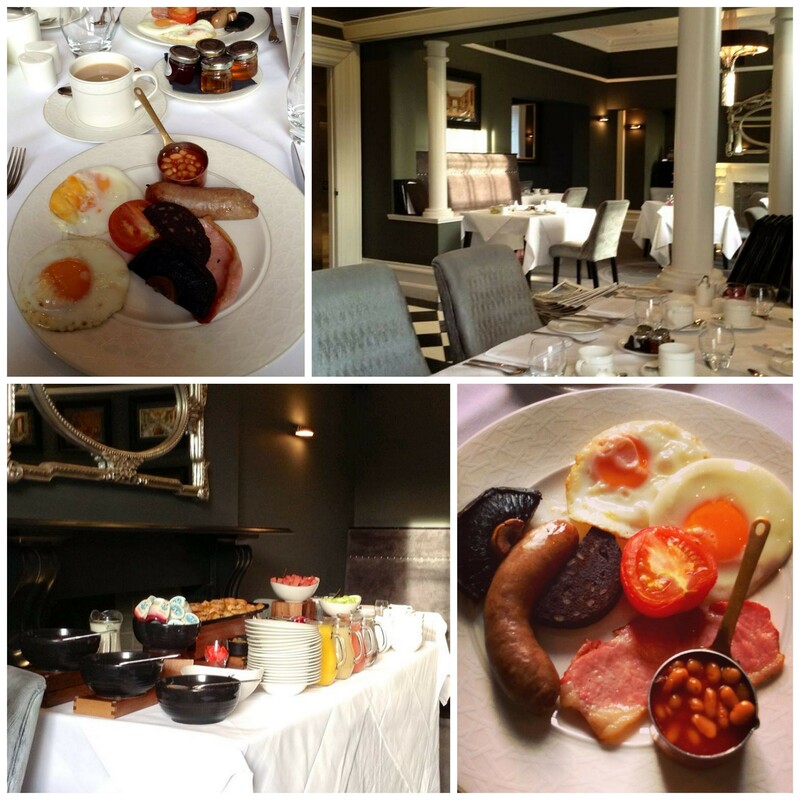 We both ordered the full English breakfast with two fried eggs, bacon, black pudding, sausage, tomato and baked beans. Coupled with some tea and toast, we were good to go. 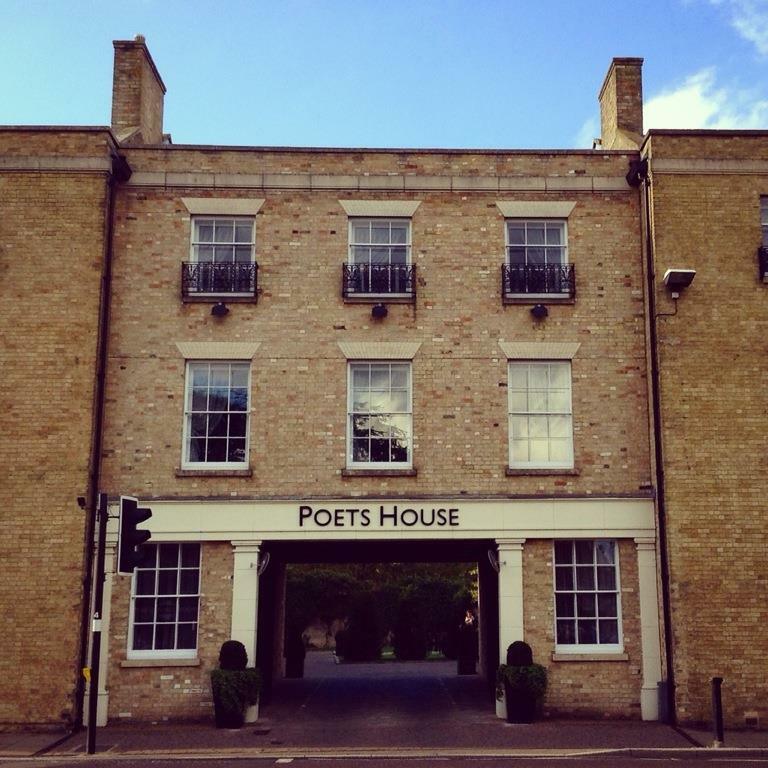 Our stay at Poets House was a nice little getaway and we enjoyed the impeccable surroundings and fine dining. Service was excellent throughout. Bar, dinner and breakfast staff, reception staff, butlers and valets… all worked well as a team. 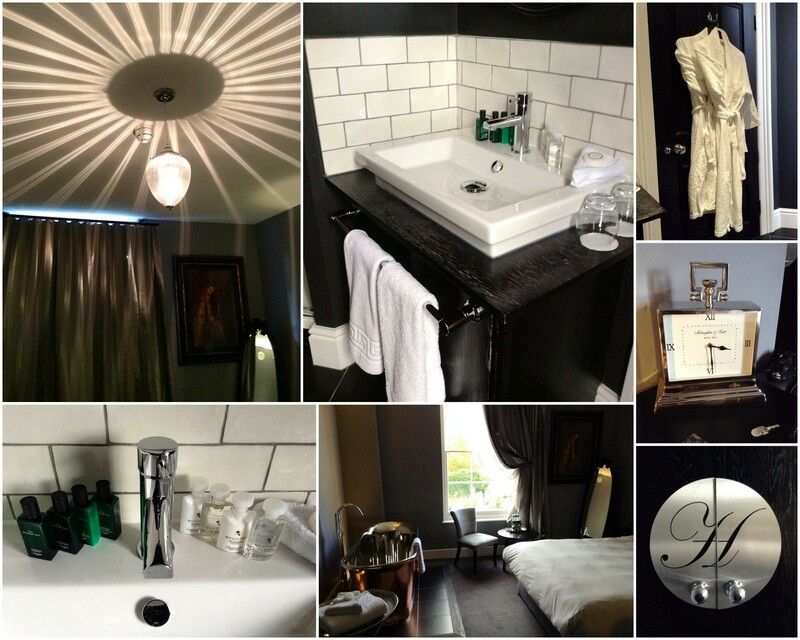 We had a gorgeous room and I’m still dreaming of that sumptuous copper bathtub! This entry was posted in Restaurants and tagged black trumpets, Cambridgeshire, cod, creme brulee, crotin, Ely, lemon posset, ox cheek, pain d'epices, Poets House, pork, The Dining Room by One Two Culinary Stew. Bookmark the permalink.